superduke forum • View topic - How many miles on your 1290? How many miles on your 1290? Re: How many miles on your 1290? 1) "Velvet": This thread dispels a lot of myths out there that question KTM engine longevity. I see KTM trashing all of the time in various threads and forums. 2) "rattis": There are too many idiots and too few comets on most forums. I'm just over 8000 miles in 1 season because winters here with the cold, salt on the roads, etc make riding hardly worth it. I do get your concern with this engine being so powerful and new but hows it running? what were the valves like at 9K? Some trade their rides as soon as the warranty is about to run out, looking at resale values I expect that gets expensive. Why not get the valves done(your dealer will just take it out of your trade value if you don't)see what it looks like, make your decision then. I read about many brands and it reads like friday afternoon bikes are just that and if you were unlucky enough to get one you find out pretty quick otherwise proper maintenance and your gold. Glad to here that there are people out there with good mileage. I Haven't cracked mine open at all just yet I'll take care of the valves and run it till she pops. I ride it aggressive,track days and shenanigans. Trade in is just trash on these bikes. I picked mine up as soon as they came out, Paid msrp saved freight that's about it. Now these bikes are selling for 15k including rebates.. I checked valves just after 13,000 and found one intake a shade out of spec on the tight side. A bit of lapping of the shim on paper and glass put it back in the center of the range and all good now. I could not tell any difference in performance and there was no blowback in the intake, so the valve was closing fine even being a bit tight. Know someone with a 1290 GT 27000 miles, used for touring and thrashed weekends. Zero issues. 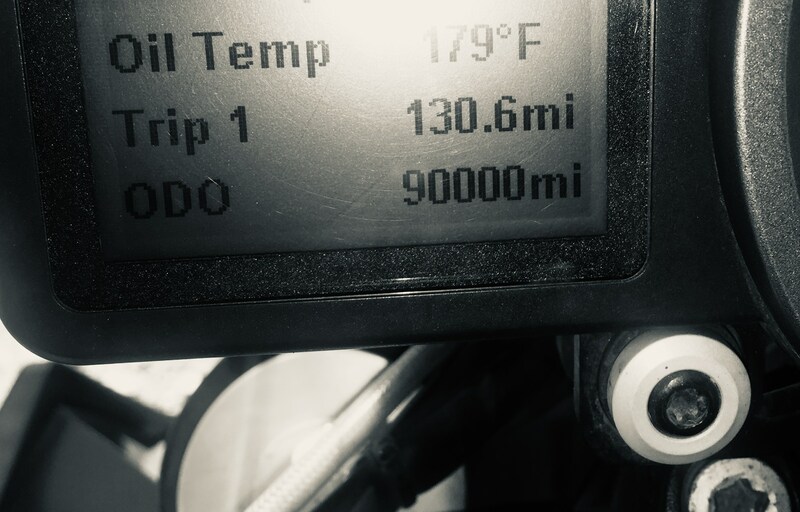 Well, I'm that guy with 56,000 miles on a 1290 SDR. I've had exactly zero significant issues with the bike. Busted mirror and taillight after warranty and that's it. Bike is ridden enthusiastically but not brutally. If tyre life is any indication of degree of enthusiasm, I've averaged about 1400 miles per Q3 type rear and about 2200 miles per Roadsmart II type rear. 3 valve adjustments have all required a few shim changes but none very far out. Bike runs like new every ride. Oil level drops maybe 1/4 quart between changes at 8000 mile intervals. Never have to add any between changes. At 20000, your bike is barely broken in. It ain't gonna "pop" anytime soon unless you've run it out of oil or coolant. That's what i wanted to here!!! Thats friggin awesome!!! Just helped me make up my mind!!! heres to another 30,000 miles!!! I just traded mine in towards a 2017 with just over 30 000 kms. Only issues I had were fuel filter jams and clutch slip after putting on the full akra and rottweiler intake. Most fun bike I've ever been on hands down. 26500 now. Will be close to 30,000 in another week or so. Continues to run well with no issues. If anything the bike has gotten smoother and more fluid over time. 22,000 miles on mine in just over 2 years. Also running well. 1st valve inspection showed they were all still w/in spec.. 1 leaky fork seal. coming up to 18000miles been on a few euro tours. Had a few known issues but as long as you have regular oil changes etc then should be ok. I will be stripping down the rear hub assembly this winter to asses the bearings etc and drill some drain holes. Mine has 79000 km, my wife’s has 61000. 6000 km ago checked the compression on mine - it showed 12.9 (new being a claimed 13.2). Touring, track days, weekend blasts, and daily commuter. My opinion is that the auxiliaries will all die before the actual powerplant. Your arse must be the shape a 1290 seat! 90 000 miles, that is a very nice looking picture! And in kms - almost 145 000 kms it would look even better! On the German forum there seems to be 2 bikes that have over 100 000 kms, one has maybe 118 000kms. I think it is a great bike. Sure, you have to take care of it! Impressive! What year and what issues have you had to do with? It’s a ‘14, like yours, not babied, not abused (some off-roading, a few track days) I’m on 3rd radiator: first one failed at 50K after being backed into while parked. Second one lasted two months before leaking for no apparent reason. Third has 30K on it. Had Wobbly Wheel from day 1 but it measured JUST under warranty limit so no replacement and it’s not changed a wit in all these miles. Busted taillight and mirrors like everybody else and that’s about it. One brilliant effing motorcycle if you ask me. The quest for the 100,000 mile 1290 Superduke has officially come to a (premature) end. At an actual 93,184 miles, all ridden by yours truly, a transmission bearing has given up the ghost. Until this, no, zero, none significant mechanical issues on a well-used (tracked, off-roaded, sportbiked, commuted etc.) brilliant motorcycle. Will reaching 100,000 miles albeit with a heart transplant still count?? Aha! I hoped this might catch LC4’s attention, Master of the Rebuilds. Thought about it but am thinking that, with this many miles, almost everything will need replacing and total cost would go well beyond the price of a low mileage used motor. Also much less effort: I’d rather ride than wrench even though I love keeping the bike in top shape. Which, I have to say, has been less work with this bike than any of the 30 or 40 other bikes I’ve had in 50 odd years of riding. I saw your post in one of the Facebook groups and I was wondering if it was the same bike or not. Sorry to hear that you didn't make it to 100K miles, but this is still great news for all of us that keep our bikes long term and don't want to worry about reliability as the miles rack up! Gutted to read this, but there it is. My 15 has just had its 90,000km service with third valve clearance check. Still nothing required there. A few issues over the last four years including rear hub needle bearing failure, front brake rotors warped, broken tail light, water in instrument panel and leaky radiator. Issues aside, I love this bike!